What the heck is this? I found it at my local Target, but have never seen anything like it before. It has a hang tab, but it’s not a fat pack. We all know what fat packs look like–they’re tall, they’re fat, they have a lot of cards and they cost five bucks. No, my friends, this is a FAT BOX. 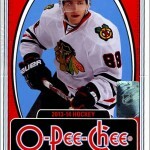 For $9.99, you get 42 2012-13 O-Pee-Chee Hockey cards. That’s not really a bargain, considering that two fat packs (at $10) would yield you 64 cards. This equates to about half of a blaster box, in both price and quantity of cards. What intrigued me about this is that it promises 1 Marquee Legends Gold card, which I think you can only get in these particular fat boxes. Other blogs have already posted their own review of this set. I’ll withhold doing a review until I have the complete set. But my overall impression is positive–at least for the card fronts. The photos on many of the cards are action-oriented. 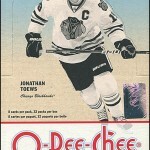 And the O-Pee-Chee logo is a whisper–as it should be–and not a yell. Here are a few more base cards that had appealing photographs. YAY! 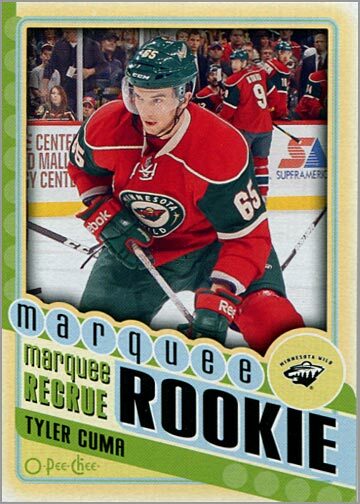 A “leftover rookie.” Tyler Cuma played 1 game last year for the Minnesota Mild, er, Wild, going scoreless but getting 2 penalty minutes. How about that? 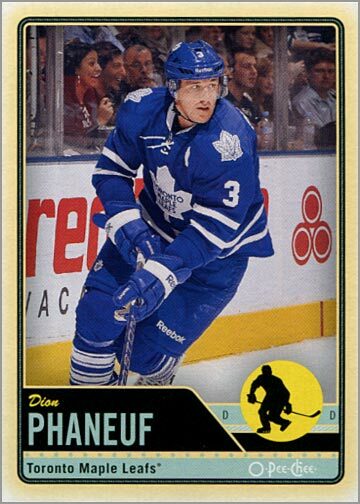 I got a Marquee Rookie (seeded 1:2) and a Sticker (seeded 1:8) in the same fat box. 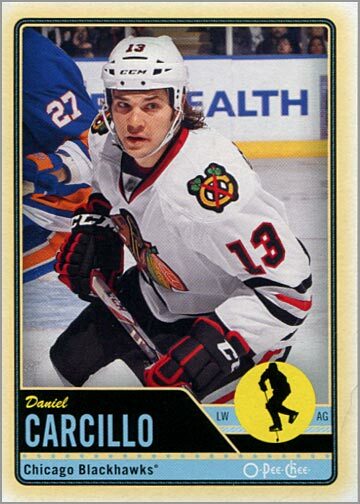 I like the design of these stickers better than the base set–they look like a cross between the 1982-83 O-Pee-Chee cards and 1975 Topps Baseball cards. For some reason, I thought that a “Gold” card would be like a gold foil card, or be somewhat shiny. This just replaces the tan ink on the borders with gold ink. 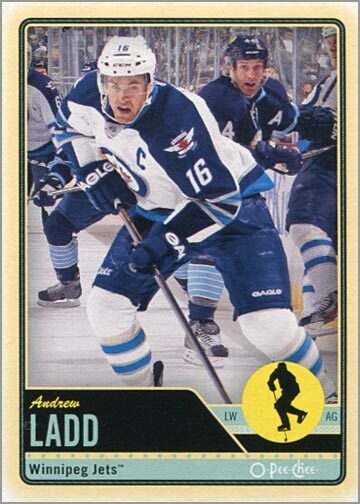 While Patrick Roy was an amazing player, this card really isn’t reason enough to buy these fat boxes. I am still debating if I am going to buy boxes and try to build this set, or if I am going to just buy it outright.I really want all of the stickers, and I want to build the Retro Set, so packs would be the way to go. Buying a set wouldn’t be much more than $120 or so, but I’d still want the retros and stickers, too. What are your thoughts? 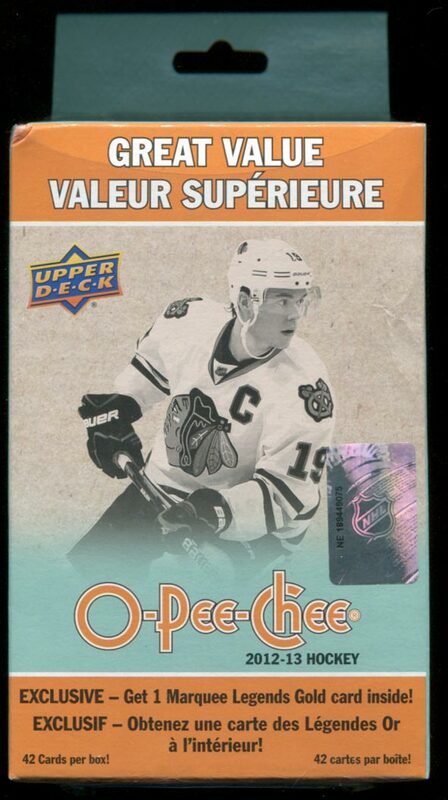 Are you building this year’s O-Pee-Chee set? What about the insert sets? Check out the One-Card Challenge contest, running from now until the end of September. I’m about halfway to the set, 1-600. 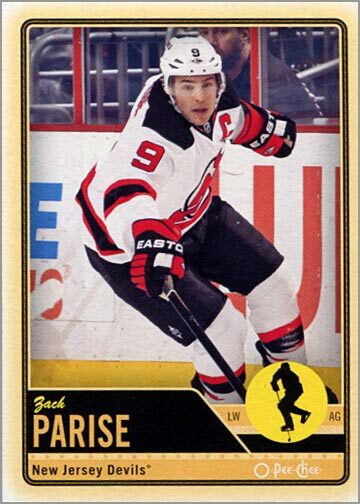 I’m about 45% done the sticker set, and I only need just under 200 cards left to complete the retro set, 1-600. Around how many packs have you bought? Also, how is the collation? I remember buying like 12 boxes of 2007-08 OPC and still being 20 cards short (with over 1,000 doubles and triples). I found the collation to be average. Bought 4 jumbo packs (32 cards each), about 15% doubles. But there were 3 checklists in one pack, if you can believe that. I hope they were at least different checklists in that fat pack! 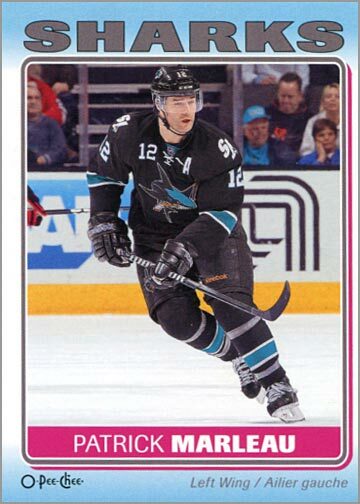 I can’t say I hate you but I really hate/have Extreme Jealousy of Whoever pulls a Nice Patrick Roy that I don’t have. 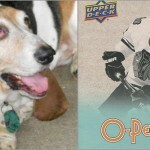 It’s a nice set I am just in it for the Roy’s/Toews and other Blackhawks like with most cards. If you are going to the Target on State Street in Chicago I could not find any cards there. But Nice Reviews and If you EVER want to PART with the Roy I would be willing to trade for other cards in the set or sell. Of course I am building this set. I still haven’t completed the last six years worth of sets. So why wouldn’t I start another one? I am 87 cards short on the regular base cards. I haven’t logged the SPs yet. And that’s after polishing off two hobby boxes, two blasters, and a pile of fat boys. I think I have just as many doubles as regular set worthy cards. Sad. Just sad. Now I find out there is some deckle-edge facsimile auto set with a collation rate of 1:a bazillion. Ridiculous. …and that’s why last year I decided to just buy a complete set with SPs for around $130. No pile of doubles. Oh, and on those “fat boxes”…Topps has been putting those out for three or four years in their football and baseball retail products. 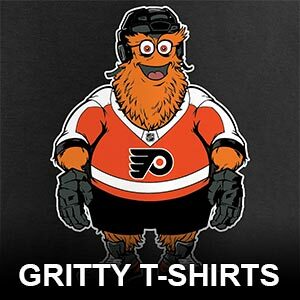 It was only a matter of time before someone copied. I don’t see what advantage they give. They are basically “half a blaster box” for $10, but with less chances to score Short Prints. 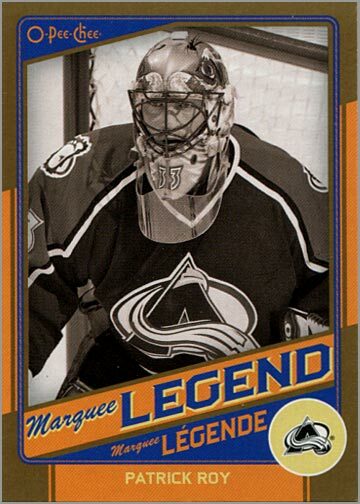 the Marquee Legend Gold card is the key and the only reason to buy it… where can i get it in quebec canada? I don’t know. Are there any Target or Wal-Mart stores in Quebec? If not, maybe a large department store would have them. 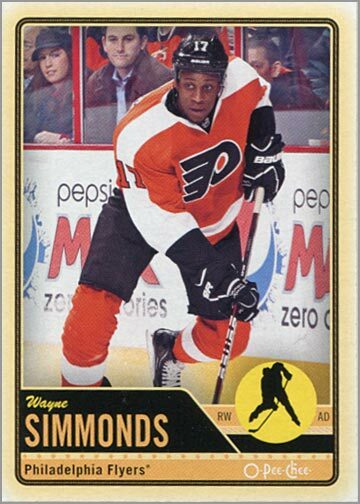 Any chance you would be willing to sell or trade that Roy Gold Legend card. I am looking to complete the set. Its the last one I need.